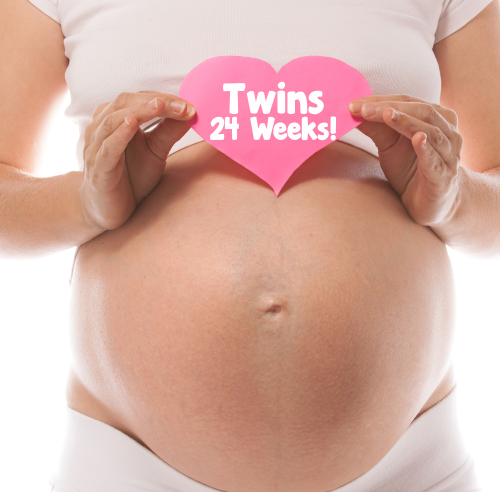 Twin pregnancy 20 to 24 weeks can feel like quite a milestone. By the end of this stage, each twin will weigh in at about 1 1/4 pounds and measure around 12 inches. They are covered in downy hair called lanugo, as well as a cheesy coating of vernix (thought to protect the delicate new skin). Both of these will likely still be apparent at birth. Taste buds are starting to form and the lungs continue to develop their complex structure to prepare the body to breathe oxygen. Facial features are mostly complete with dainty little noses and mouths. Rapid brain development continues as well. At 20 to 24 weeks twins are typically seen in the traditional fetal position via ultrasound, with hands towards the face and legs tucked up. It's starting to get a little cramped as the uterus expands to accommodate your growing babies. They are constantly in contact with each move they make now. They are developing a smidgen of fat under their otherwise translucent, wrinkled skin and their fingerprints and footprints have formed too...which will be completely unique to each twin even if they're identical. With your rapidly expanding uterus you may well notice the start of stretch marks, sometimes accompanied by itchy skin. Some women will also experience "the mask of pregnancy" (chloasma) which is a brownish discoloration commonly appearing on the forehead, cheeks, upper lip and chin which usually diminishes after pregnancy. Just like last month you will likely be feeling much warmer than usual due to the increase in your resting metabolic rate. Another common issue is edema, which is the accumulation of body fluids in the tissues during twin pregnancy. This leads to your lovely swollen feet, ankles, and even hands. Anemia (low iron in the blood) and leg cramping frequently develop during this time as well. Leg cramps can be very painful, but will usually subside pretty quickly. Your growing babies are constantly jostling for position, so you should be able to feel their movements daily. With a twin pregnancy your body is obviously much more taxed than with a single pregnancy. Most mothers will experience acute symptoms as the body uses important resources to benefit the growing babies first and foremost. 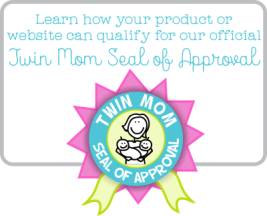 This can leave Mom feeling all of the ailments of pregnancy twofold!